Well, summer finally arrived here. We've gone more than 2 days with no rain and it is humid and in the 80s and 90s. Looking forward to fall which is my favorite season - football, boots, jeans, sweaters! My June Birchbox came later in the month, only a few days before we left on vacation so I didn't really have time to try anything out and review it for you. July's box came early in the month so I've been using all the products from both months and even finished a few of them so I figured I'd get my reviews up for you. Birchbox is $10 a month and has a great points system. See past posts if you'd like more information on how it works. Temple Spa Good Hair Day Shampoo - I liked this shampoo because it didn't bother my scalp or dry out my hair. On the other hand, I don't think it was special enough to purchase a full size. The full size price is $14. I've tried other shampoos I prefer. Temple Spa In Good Condition Conditioner - I preferred the conditioner to the shampoo because it was a nice lightweight conditioner that didn't weigh my hair down, especially once I cut it short and wanted to have some more volume. Again, I'm not sure it was great enough to spend the $14. Supergoop Everyday SPF 50 - This was great for a recent trip to Austin and I have used up this whole tube (empty spoiler:). That being said, it was too greasy for my skin and made me way too oily (more so than other sunblocks I've tried). It works well on my arms and legs that are more on the dry side. A full size ranges from $19-$48 depending on size. Well People The Expressionist Mascara - I honestly haven't opened this product. I am working on two mascaras now and I don't want to ruin this one by opening it and having it dry out. I will be replacing my mascaras at the end of July and will put this one in the rotation so watch out for updates. A full size is $23.50. Marcelle Waterproof eyeliner - The shade I received is Blue Lagoon and it is a pretty teal color. It has been a fun color for summer. I run it along the bottom lash line or the top lash line. To tone down the color when needed, I've put the teal in a thick line along my top lash line and then run a brown closer to the lash line so only a bit of the teal peeks through. A full size is $11 and I'd purchase more neutral colors in this formula. L.Erickson Ponytail Holder - I really liked this. It didn't pull on my hair but it was also very stretchy and it didn't hold my thick hair as well as I'd like. The card that comes in the box says a full size is $12 and I hope that is for a few ponytail holders and not just one. I won't be purchasing now because I have a ton of hair ties and recently cut my hair off and aren't using them much. Coola Classic SPF 30 Cucumber Moisturizer - This is a nice light moisturizer and it doesn't make me as greasy as a traditional sunblock. I have a sunblock and moisturizer I really like so I think I will just stick to that combo. I do love the cucumber scent though. A full size is $32. Dr. brandt Microdermabrasion skin exfoliant - I have tried this before and I really like it. I have a few other exfoliators already open so I didn't use this one but I know it is a great product. It isn't too harsh and has never bothered my sensitive skin. I love how smooth my skin feels after I use it. A full size is $78 so it is an expensive product. Still Look at Me Liquid Lipstick Trio - I got a bright orange shade called Venizia. This color is way outside of my comfort zone. I usually stick to pinks and nudes. I will try it, maybe with some different glosses to make it more wearable for me. This comes as a shade in a set of 3 for $20. 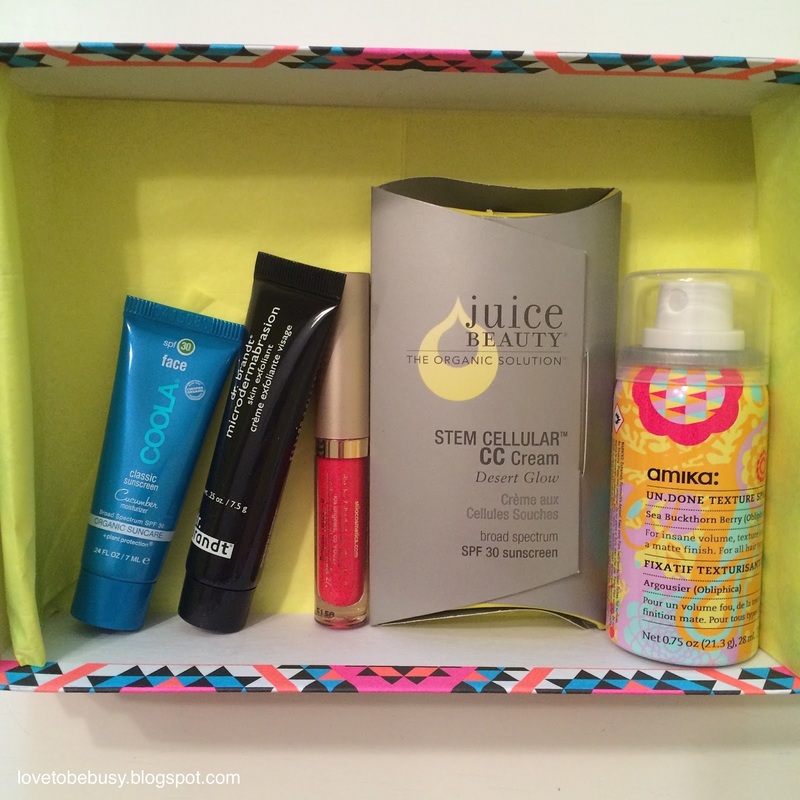 Juice Beauty Stem Cellular CC Cream - I'm a big fan of this product. It is a very light cc cream that provides just a bit of coverage. When I put a powder over it, I loved the amount of coverage it gave me, even for an every day look (I prefer light to medium coverage). I have been wanting to try the It Cosmetics CC Cream but if I don't like that one, I would buy this one as my every day foundation. A full size is $39. Amika un.Done Texture Spray - I love the Amika dry shampoo so I was excited to try this. As I mentioned, I have recently cut my hair so this was the perfect product to mess it up and give it some volume and texture. It worked well although I felt like I had to use more than I wanted to get a good amount of volume. It also made my hair greasier so it would have to be a product I use only when I know I'm washing my hair at night or the next morning. A full size is $24. I enjoyed the products in both of my boxes. I know people don't always like the small sizes and lack of makeup in Birchbox but I am able to try a product and know if I like it or not without wasting it if I don't. Also, I love trying new skincare more than makeup so I love the amount of skincare they send out. How have you been feeling about your products? Find any gems?